Yemen was on the brink of a full-scale regional war on Wednesday as its president fled an advance by Iran-linked Shia rebels and Saudi troops threatened to intervene against them. The rebels earlier seized the main airbase near Aden, until recently used by the United States to fly drones on the hunt for al-Qaeda operatives in the country. British and American special forces had also been based there before being withdrawn earlier this month. 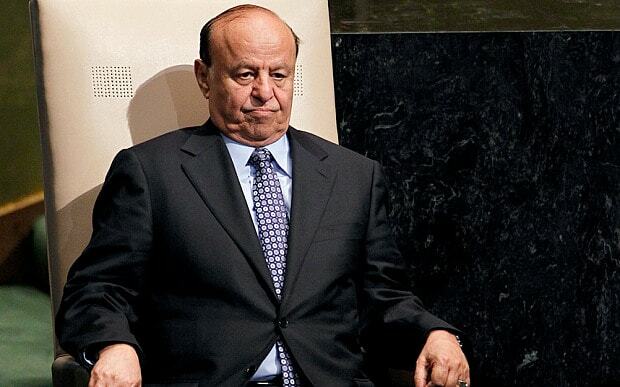 President Abd Rabbu Mansour Hadi fled the presidential palace compound in Aden, which came under attack from air force jets allied to the rebels, known as the Houthis and allied to Iran. Officials at first denied rumours that he was leaving the country for either Oman or Djibouti, saying he was directing operations to defend Aden from an undisclosed location. Later reports claimed he had left the country with his aides by boat. Meanwhile, there was gunfire on the northern outskirts of the city and the Houthis were poised to bring the third main population centre of Yemen under their control. 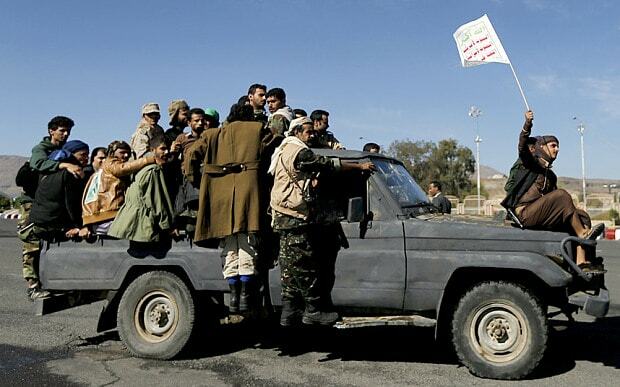 They captured the capital, Sana'a, last September and Taiz, the third city, on Sunday. The Houthis' rapid advance has been celebrated openly in Iran but shatters the policies designed to rebuild the Arab world's poorest nation devised by both its neighbouring Gulf states, all Sunni-led, and their western backers including Britain and the United States. As the Houthis advanced, the country's notional foreign minister, Riyadh Yaseen, appealed for its neighbours to intervene. Saudi troops and heavy weapons were already said to be massing on Yemen's northern border. However, a previous attempt by the Saudis to take on the Houthis, in 2009-10 when they were merely a rebel band on Saudi Arabia's borders, ended with heavy losses. Mr Yaseen made his request in Egypt, where he was preparing for an Arab League summit. "We will ask the upcoming summit for urgent intervention, military intervention," he said. The league said the request would be discussed on Thursday, while Prince Saud al-Faisal, the Saudi foreign minister, has also warned that the country might take action to protect its regional interests. However, the request brings back unhappy memories for many in the region of previous attempts to shape the country. Gamal Abdul Nasser, Egypt's charismatic leader in the Fifties and Sixties, referred to his army's secret battles there as his Vietnam. The leaders' summit starts this weekend, with Mr Hadi due to attend. Whether he will be in a position to return to his country afterwards is another matter. The Houthis' charge south began after they formed an alliance with Ali Abdullah Saleh, the long-term leader of Yemen who had worked closely with the West in his 30 years in power. He faced a popular uprising at the start of the Arab Spring in 2011, which he resisted including by use of force until both Saudi Arabia and the United States withdrew support. Crucially, the final deal which saw him replaced by Mr Hadi, his vice-president, granted him immunity from prosecution over corruption and other allegations levelled against him, and allowed him to stay in the country. 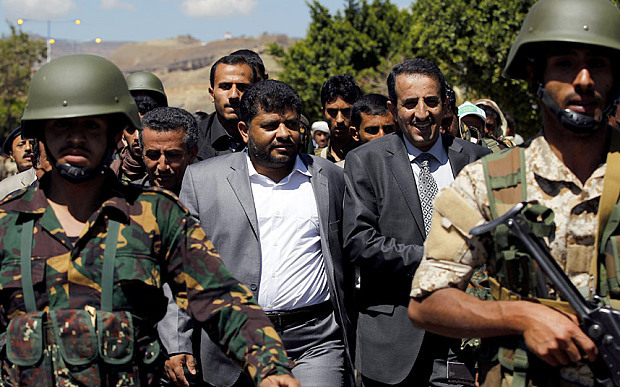 He had installed relatives and supporters throughout the security apparatus, and subsequently used them to undermine Mr Hadi and, ultimately, to join forces with the Houthis, whom he had regularly fought while in office. Despite their previous hostility, Mr Saleh is from the same Zaydi Shia sect as the Houthis, though the majority of Yemen's population is Sunni. A victory for the Houthis in the more heavily populated west of the country would see them in a direct face-off with al-Qaeda, which has a strong presence in the east and centre. Worse, from the West's point of view, would be a stand-off in which a hostile Houthi regime – the group's motto is "Death to America, Death to Israel" – did not allow for continued American operations against the terrorist threat. A series of attacks against the West, including the attempted "underpants bombing" on an airliner landing at Detroit Airport on Christmas Day 2009, were launched from Yemen, which is home to al-Qaeda's deputy leader. 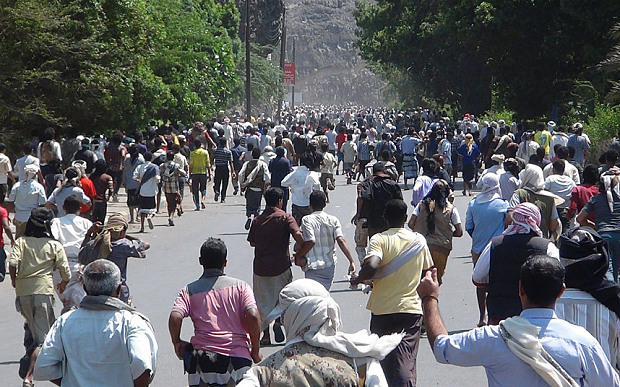 Meanwhile, bodies of fighters from both sides lined the streets of towns to Aden's north, according to local reporters. There was the sound of gunfire from Aden's main military base, as remaining troops loyal to Mr Hadi fired into the air to deter looters trying to seize weapons for themselves.